Happy 4 months, Happy Leap Year! 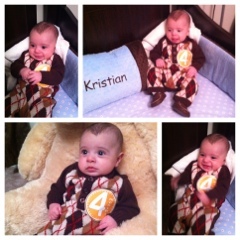 Baby boy you are 4 months today! Happy leap year too! You won't have this day for another 4 years! 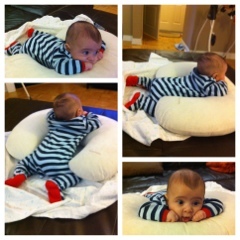 What's going on at 4 months. We still think you are teething, you rub anything you can get in your mouth on your bottom teeth. You grab your toys and you put them right in your mouth and you try and eat those cute feet of yours too! You love to babble and scream and talk to us. You smile and laugh so much. We love your smile! We love when you get excited and kick and wave your arms like crazy it's hilarious. You love attention, you love being talked to and love being held outwards so you can see the world. You just stare at daddy when he speaks and he makes you giggle so much. This month we will have some firsts. Like leaving you with daddy for 8 hours! I know you will do just fine. It's more of a first for mama. However you still don't take a bottle, which stresses me about leaving you for long... I'm hoping you will be ok with it soon! We will bring out your baby einstein jumperoo this month so you can play and learn. You still are not a fan of the swing, I noticed that you can sit in it longer when it's not swinging haha. This week you get your second set of vaccines! I'm nervous! You are such a fun baby, you brighten our lives. We love you soo much!